If you look carefully you can see the cruise ship this couple and their families came in on in the background. We have been doing more group cruise weddings at the Governor's Beach in the last couple of weeks, since it takes less time than taking the wedding party down to Mary Mollie Hydes or Blue Water Beach. It all depends on what the couple want, some groups just want to spend time on the beach after the ceremony, while others want to explore the town. This couple from Chehalis, Washington wanted more time on the beach, and they headed off to try some watersports at nearby Westin Casaurina hotel. 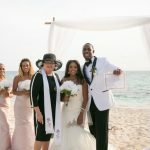 After a civil wedding in the courthouse at home, this couple had a Cayman Wedding Blessing, witnessed by their immediate families while on a cruise in the western Caribbean. 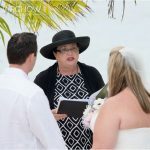 Part of this Cayman Wedding Blessing package is a certificate with all the relevant details, duly witnessed and signed. This certificate is suitable for framing, and many couples keep it as a reminder of this very special event. 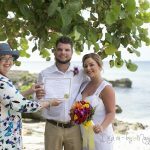 This is very similar to the All Inclusive Cayman Cruise Wedding package, but of course no Special Marriage License or Registered Marriage Certificate is required. Wedding Blessing ceremony by Joy for Simply Weddings, photos by Mari Abe for Island Photo, these flowers supplied by Trisha's Roses, called "Tropical Bouquet". 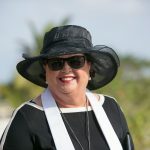 If you have been married for less than two years and want to have a Cayman Wedding Blessing ceremony, call Joy or Peggy today at +1-345-9499933 to get an all inclusive or customised Wedding Blessing package. Or email us at mywedding@candw.ky. Remember we schedule only one cruise ceremony per day so we can give you our full attention.